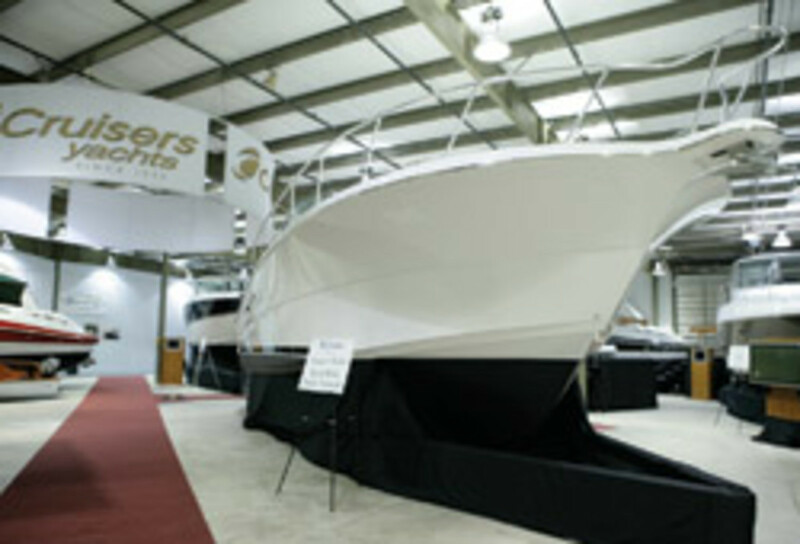 KCS International, the parent company of Cruisers Yachts and Rampage Sport Fishing Yachts, has joined the ranks of manufacturers providing factory showrooms as an alternative to dealers paying to stock numerous models in tough economic times. The 15,000-square-foot showroom, which opened Sept. 13 in Oconto, Wis., allows dealers to carry only essential models and offers customers an opportunity to see more boats in one location. In addition to visiting the showroom, customers receive VIP treatment with a personalized step-by-step tour of the production facility. "We decided to take the dealer network and say if you&apos;re a stocking dealer of two boats or more, you&apos;re qualified to be able to use this factory showroom that we&apos;re building," says Russ Davis, KCS director of sales and marketing. "So it really becomes an extension of that dealership&apos;s business and they can bring qualified customers into Oconto and sell off the models that we have on the floor here." As dealers struggle to pay their floorplan loans or, in many cases, find new sources of funding, an increasing number of manufacturers are taking steps to help ease the burden. 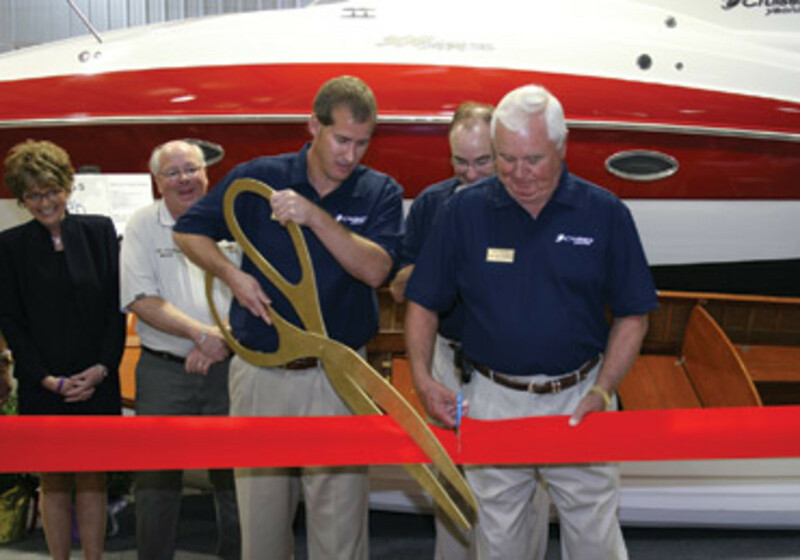 Regal Marine Industries opened its Orlando, Fla.-based factory showroom last year. Four Winns&apos; parent company, Rec Boat Holdings, recently announced that one dealership will be available to show Four Winns boats on behalf of any Four Winns "cruiser" dealer in its network. Marquis Yachts, owned by J&D Acquisitions, has four yacht centers - three in the United States and one in Monaco - where dealers can bring prospective customers. In that case, Marquis dealers in good standing don&apos;t have to stock even one model, says J&D chairman Irwin Jacobs. "We&apos;re thinking out of the box to figure out how to market and sell product differently," Davis says. "This showroom is just an extension of that thinking out of the box." When a prospective customer flies to Oconto, the dealer will cover the airfare and KCS will pay all expenses, including hotel costs, once the person arrives, Davis says. And although it may seem like a significant expense to fly someone to Wisconsin and give that person VIP treatment, Davis says it&apos;s worth it, considering that the company&apos;s smallest yachts start at 30 feet and cost between $150,000 and $200,000. Larger models cost more than $1 million. "So spending $1,500 on a trip is worth it," he says. Davis says dealers who have visited the showroom are impressed and he expects that it won&apos;t be long before customers come to town. "It seemed like, through the years, we&apos;ve been able to close customers when they can tour the plant. The plant is very impressive," he says. "They see how the boat is built, they see the quality of the product and then they can see the finished product in the showroom. It just closes the deal." Prospective customers will fly to Green Bay, he says, and although that may not sound exciting to some, Davis says football fans may appreciate the trip. "It&apos;s not Disney World in Florida, like Regal has, but we do have an attraction in Green Bay called the Packers," he jokes. Tony Donarski, vice president at Skipper Bud&apos;s in Ohio, says he recently toured the new showroom and was impressed. The Cruisers Yachts dealer expects that he&apos;ll be sending prospects to Wisconsin in the near future. "They did a real nice job," he says. "It&apos;s bright, it&apos;s conducive to showing product, and in today&apos;s environment where can you go and see the entire product line inside one place?" he says. 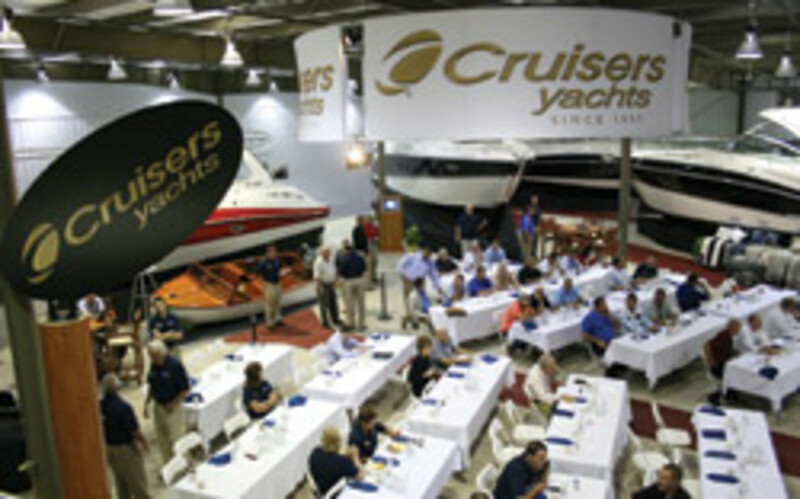 "With the constraints that most dealers are facing, with how much inventory you&apos;re willing to hold at any point in time, here you have, in essence, a factory boat show with the theory that it&apos;s going to run 365 days a year." Davis says the company has about 65 dealers, down from the number it had before the recession. "We, like everybody else, lost a good share of our dealer network, but we&apos;re in rebuilding mode," he says, adding that the company lost about 50 percent of its network and has rebuilt to the current level. In more "normal times," he says, the company would have about 100 dealers. Mark Kellum, marketing manager for Regal, says that although his company doesn&apos;t track specific sales coming out of its factory showroom, it&apos;s been getting "more and more traffic all the time. More people have heard about it, and when they get here in Orlando they want to stop by," he says. He says that if the company tracked the number of registered boats since January, when the showroom opened to the public, the number of people who visited and bought a boat might be in the hundreds. "Part of what&apos;s been a big success for us with the showroom is we&apos;ve gained dealers because of it," Kellum says. "The dealers come and look at it and they go, &apos;Wow, this is a great opportunity.&apos; We&apos;ve done very well converting dealerships. That&apos;s part of the strategy." Also, being based in Orlando - the site of some of the world&apos;s best tourist attractions - helps, he acknowledges. It&apos;s easy to fly there, and hotels and rental cars are relatively inexpensive. Four Winns and Marquis are taking slightly different approaches, but the concept is the same - reduce the need for dealers to stock numerous models. Rec Boat Holdings, which manufactures Four Winns, announced in late September that Destin, Fla.-based Legendary Marine is its "premier demonstration dealer." Legendary Marine has four locations in the Florida Panhandle and Alabama, and any Four Winns "cruiser" dealer in the network can send prospects to the dealership for first-class accommodations and an on-water demonstration with a product specialist and licensed captain. "The current marine environment dictates a new business model for the sale of new boats, and the management team at Four Winns is stepping up to the challenge," says Fred Pace, the dealership&apos;s managing partner. "We have the facilities to provide resources needed to sell boats year-round and, although another Four Winns dealer may be credited with the sale, we, as a dealer, will participate in delivering a more positive experience for that customer." Marquis Yacht Centers - with two locations in Florida (including one at Legendary Marine), one in Atlanta and one in Monaco - allows dealers in good standing to stop stocking the boats altogether. Any Marquis dealer can send prospects to any of the yacht center locations, Jacobs says. "It&apos;s been phenomenally successful," he says. "For those companies that are capable of doing it and putting on the right kind of environment, it&apos;s perfect. ... It&apos;s not 99 percent; it&apos;s a 100 percent sure success story."